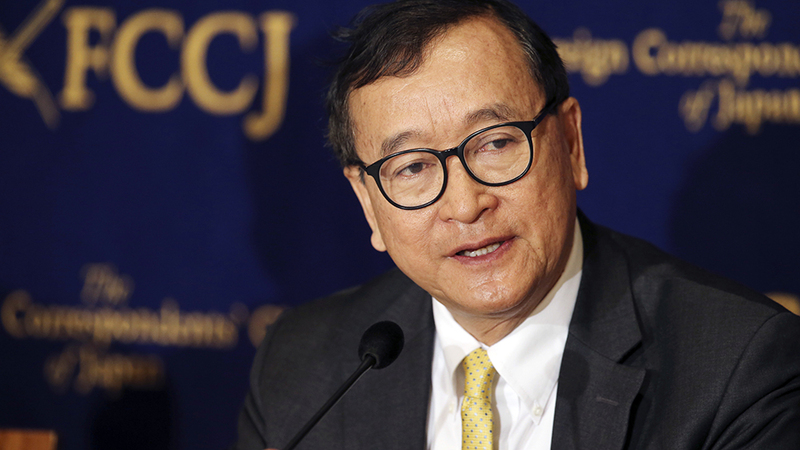 Cambodia's self-exiled opposition leader Sam Rainsy speaks during a press conference in Tokyo, April 13, 2018. Cambodia’s Interior Ministry has received a warrant to arrest acting president of the now-dissolved Cambodia National Rescue Party (CNRP) Sam Rainsy upon entering the country, Prime Minister Hun Sen said Friday, daring the opposition chief to honor his pledge to return from self-imposed exile. Sam Rainsy left Cambodia three years to avoid what are seen as a string of politically motivated convictions on defamation and other charges, and ceded control of the CNRP to then-vice president Kem Sokha as part of a bid to prevent the government from shutting down the opposition party. In September 2017, Kem Sokha was arrested over an alleged plot to topple the government, and the Supreme Court dissolved the CNRP two months later, leaving Hun Sen’s Cambodian People’s Party (CPP) with no viable challenger in a general election last July that saw the ruling party win all 125 parliamentary seats up for bid. The CNRP has continued to operate abroad, but Sam Rainsy recently pledged to return to Cambodia by March to lead the party inside the country, despite the threat of arrest. On Friday, Hun Sen addressed Sam Rainsy during a speech to garment factory workers in Kampot province, telling the exiled opposition leader, “I truly want you to return” to face his convictions. “You must be aware of the court’s verdict—Interior Minister Sar Kheng confirmed yesterday that he has received the related arrest warrant, so there is no issue with that,” he said. Earlier this week, Cambodia’s government issued a statement warning that authorities will “take action” against anyone who identifies as a member of the CNRP and gathers to welcome Sam Rainsy back to Cambodia. The statement also warned that if Sam Rainsy’s return is associated with the CNRP, the government will view it as a violation of the Supreme Court’s November 2017 decision, but added that “the executive branch is separate from the judiciary,” and will not interfere in any legal decision. Also on Friday, the prime minister lashed out at the U.S. and other countries that have dismissed Nicolas Maduro’s claim to Venezuela’s presidency as illegitimate following elections widely seen as unfree and unfair, and backed opposition leader Juan Guaido to helm the nation. Maduro was sworn in for his second term earlier this month, but Guaido, who is president of the opposition-controlled National Assembly, says he has the constitutional right to take power because Maduro assumed office illegally. “I don’t understand what is going in Venezuela—the U.S. and some other countries don’t recognize the elected and siting president, and instead recognize the opposition leader, who has sworn himself in as president,” Hun Sen said. Hun Sen also warned western countries against interfering in Cambodia’s internal affairs, as in Venezuela, because doing so would destabilize peace in the Southeast Asian nation. Following Cambodia’s July ballot, the U.S. announced visa bans on individuals seen as limiting democracy in the country, as part of a series of measures aimed at pressuring Hun Sen to reverse course, and the EU, which was the second biggest trade partner of Cambodia in 2017, has said it will drop a preferential trade scheme for Cambodian exports based on the country’s election environment. Friday marked the second day in a row that Hun Sen addressed the power struggle in Venezuela while speaking to the public. A day earlier, the prime minister also called on Cambodia’s military to “smash” anyone he believes is plotting to overthrow the government. Political analyst Kim Sok told RFA Friday that Hun Sen is worried about internal conflict within his party—particularly among members of the military—as well as Western support for the CNRP, which could attempt to establish a temporary government, as the opposition has done in Venezuela. “Hun Sen is most worried about is U.S. and EU support for the people of Cambodia to stand up for a change,” he said of the political strongman who has ruled the country for more than three decades. Sam Rainsy on Friday urged Cambodia’s military to ignore Hun Sen’s demands for loyalty and call for them to attack those who oppose him. “I appeal to the armed forces not to use their weapons to shoot people for Hun Sen,” he said in a post to his Facebook page. Hun Sen has warned repeatedly that CNRP leadership in Cambodia would bring instability and war to the country, and threatened to use the ruling party-controlled military to eliminate anyone calling for an end to his government. Reported by RFA’s Khmer Service. Translated by Samean Yun and Chrea Vanrith. Written in English by Joshua Lipes.